Conclusion - Is OnlineJobs.ph Worth It? 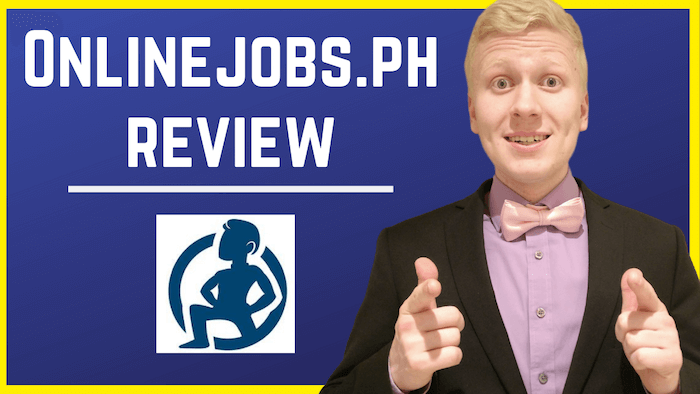 Before you dive into my comprehensive OnlineJobs.ph article, I want to give you an opportunity to take a look at my video review below. I know that many of you prefer watching a video instead of reading a text so I created this video for you as well. Feel free to ask me if you have any questions regarding the video or OnlineJobs.ph and I'll be more than happy to help you out. I heard the first time about OnlineJobs.ph when my friend told he had hired an awesome full-time writer for his blog for just $400/month. "How is that possible?" I asked myself. Then he introduced me to OnlineJobs.ph and I am glad he did. Soon after that I also found a great writer for my blog and I noticed that you can hire workers through this website for basically ANY digital work. OnlineJobs.ph is a job marketplace that connects small online businesses with skilled Filipino digital workers. It is known as the best online job marketplace in the world for outsourcing work to the Philippines. I know several people who have used this site for finding great virtual assistants and digital workers for a low cost. Next let me share with you a few words about the founder of this website. The founder of OnlineJobs.ph is an American man called John Jonas. He has been making a 6-7 figure income online since 2004 so he has a HUGE experience of running online businesses. The Founder of OnlineJobs.Ph, John Jonas. John has himself hired probably 10's, if not 100's of Filipino workers online through his career and nowadays he's also teaching other people how to do the same. He has provided jobs for many Filipinos which is a great contribution for them. At the same time, he has made also millions through his online businesses. John says that he's working currently 17 hours per week because he prefers spending more time with his family than working. The website is very simple to use. Let me explain you the steps to hire your first worker through this site. First, sign up here and create your free account. Second, you can scroll awesome Filipino workers & their profiles based on the criteria that you set. Then you can contact potential workers and discuss with them about more details and hire the right one. You’ll start getting contacts from potential workers. Hire the best candidate and start the collaboration with your worker. I recorded for you a video where I show you step-by-step instructions on how you can get started on OnlineJobs.ph and start scaling your online business. It's actually very simple because their platform is easy-to-use and by following the instructions in my video below you'll get started fast. When I first time signed up to OnlineJobs.ph I was impressed by the number of high-quality professionals in the platform. I believe that after a quick scrolling on the site, you’ll notice the same. The myth that Filipino workers wouldn’t be good is completely false. The ONLY sure thing when hiring between a Filipino and a Western worker is that you often need to pay much more for the Western worker who provides the same value. Do you remember my friend who hired a skilled writer for just $400/month that I mentioned above? That’s just one example out of 1,000’s great examples from the platform. 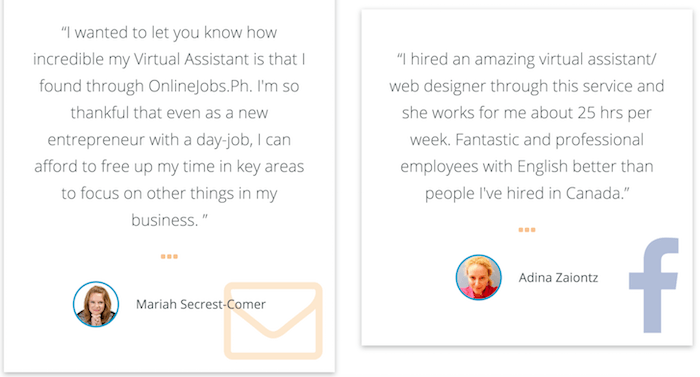 There are lots of positive stories from people who have used OnlineJobs.ph for hiring Filipino workers. I’ve also been in the US and I have friends from there. In many cities, you’d need to pay easily 5-10 times more in order to maintain the same quality of living that you can get for a cheaper price in the Philippines. It’s a win-win situation. You can provide a salary for a Filipino worker that’s high compared to others in the Philippines but low compared to a Western salary level. I say this from a VAST EXPERIENCE. I’ve discussed online personally with 100’s of Filipino people. They’re very respectful and nice people with a good will. Of course, there are exceptions in any country/culture but on average Filipinos are really respectful. If I would compare it to my experience when being in touch with 100’s and even 1,000’s of people from other countries, I’d say that Filipinos are some of the most respectful people in the world. If you’re a man, they usually call you “Sir” and if you are a woman, they may call you “Madam” to show respect. You can then see each person’s profile and previous jobs through the OnlineJobs.ph platform. Sometimes their previous employers have left them reviews and experiences of working with them. Most workers on the platform have also connected their Facebook profiles to OnlineJobs.ph. This can give you more information about the potential worker. I’d say that when you’re hiring a Filipino worker, you can worry 10 times less. They have a reputation of being much more loyal than many Western workers. I know several people personally who have hired Filipino workers and almost all of them had positive experiences with them. OnlineJobs helps you to filter out all the fake profiles with this feature. ID Proof is a number between 1 and 100 that show how accurate a person's profile is. The higher the number, the better. This Person Had an ID Proof of 87. If someone's ID Proof number is less than 60, I wouldn't bother with him. Notice that for some reason, nobody has a ID proof 100 in the platform. If a person's ID Proof number is higher than 70, I think it's okay. If the number is more than 80, that's great. At the same time, I want to remind you that a high ID Proof number doesn't indicate about high skills of a worker. It just indicates that the person's information is accurate and reliable. 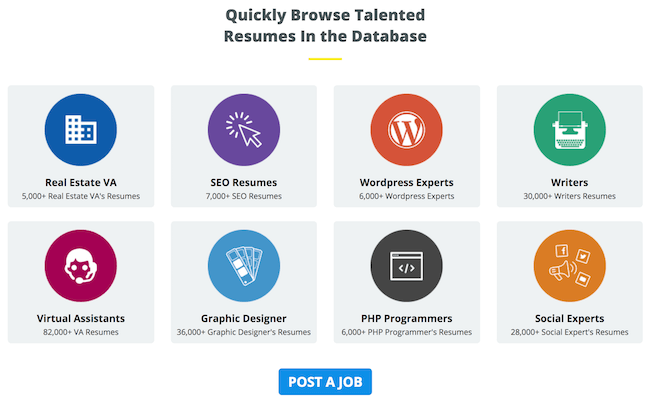 OnlineJobs.ph provides for you a Bonus tool called TimeProof. With that you can track the time a virtual assistant is working. Then you don't need to guess how many hours the VA was working because the TimeProof tool does it for you. Personally I don't recommend that you use this kind of time-tracking tools too much with your workers. It's much better to build a mutual trust with your workers and paid for the work they deliver. That being said, this kind of tool like TimeProof can help you at the beginning. When I started outsourcing tasks online (not on OnlineJobs.ph initially), I had a challenge “Why don’t they follow my instructions exactly?” I gave certain instructions but freelancers didn’t do exactly what I had instructed them. This mind shift has really helped me personally a lot. It’s YOUR responsibility to hire the right person. It’s YOUR responsibility to give comprehensive instructions. It’s YOUR responsibility to provide everything so the worker can do his job well. When you develop your outsourcing skills, your virtual assistants are going to do the work better. Most workers want to provide you a good work but you need to remember that eventually you have the responsibility of what happens with your business. It's good to give your worker's freedom but if something happens that wasn't according to your instruction, maybe you can try to give better instructions next time? If you really want to hire a great worker through their platform, I recommend that you get a paid plan either for $69 or $99. 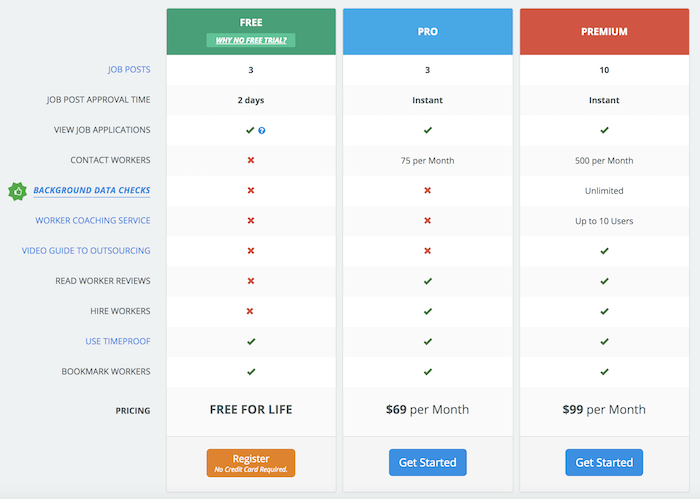 On their website, OnlineJobs.ph says that the price is $69/month or $99/month for the paid plans but notice that you only need less than 1 month to find the right worker. Therefore, my recommendation is that you just buy the membership for 1 month and then cancel it once you’ve found what you were looking for. 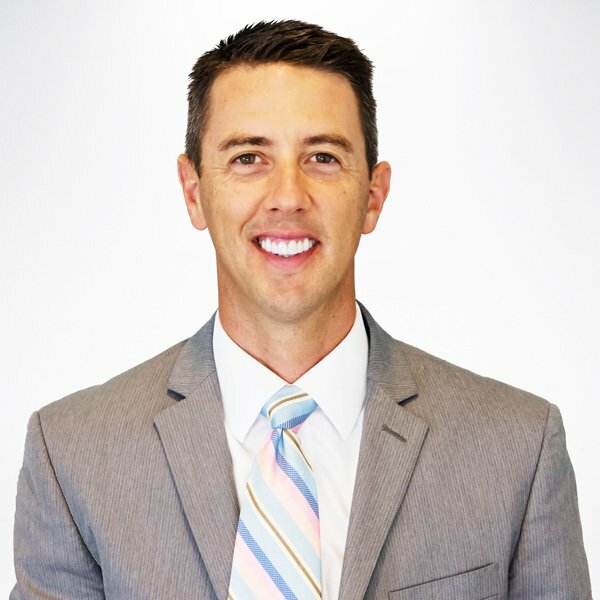 I used myself $99 membership to find the best worker and it was great. You can really see lots of information about potential workers and what they have put into their profiles. I’ve used myself probably around 10 different websites to outsource some work online. The reason why I’ve tried so many is that I’ve wanted to know which one is the best so I can recommend the right one for you and for my audience. High price does NOT guarantee you anything. The only thing that a high price guarantees is that you’ll need to pay more for that service. I have bought articles for as little as $8 and for example one $14-article made me +$877. If you’re buying services from a ‘wrong person’ / provider, you’ll may end up paying 5-10 times more than on another site. Remember that $1,000/month for a digital worker who lives in the United States, is never enough while for a person in the Philippines that can be an awesome salary. Therefore, you’ll pay by default more money for those who are living in the US (or other expensive countries). OnlineJobs has given me the BEST RETURN ON INVESTMENT out of all similar sites that I have used online. If you need to buy just 1 graphic, 1 article or 1 ‘something small, then Fiverr may good one. But if you want to have a virtual assistant / digital worker for long term, OnlineJobs.ph is often the best choice for you. The short answer: Definitely YES! Lots of Skilled & High-Quality Digital Workers. And MORE BENEFITS. You'll experience yourself all the benefits in practice when you start using it. Create your free account today and hire soon your first Filipino worker / Virtual Assistant! Do you have any questions for me regarding OnlineJobs.ph? Have you used OnlineJobs.ph yourself? Are you going to take action and hire your first worker through OnlineJobs.ph? Just leave me a comment below and I will be more than happy to help you out!